Simon Townsend of IGEL shares a recap from DISRUPT in Munich, talks about the growth of both the EUC market and IGEL and its technologies and partnerships. Townsend also talks about how Microsoft is validating the VDI and DaaS market with the announced Windows Virtual Desktop and their acquisition of FSLogix. And even more! VMblog spoke with LG Business Solutions while at the IGEL Technology #DISRUPTEUC 2019 event taking place in Silicon Valley. Watch and learn more about LG displays and how they are working with IGEL Technology to provide their displays with IGEL's operating system on the Linux side. VMblog spoke with ControlUp while at the IGEL Technology #DISRUPTEUC 2019 event taking place in Silicon Valley. ControlUp is a leading IT Management and IT Monitoring solution. 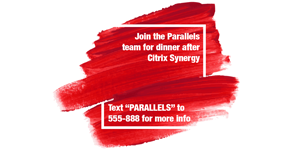 Watch this video to learn more about the company and how they are working with IGEL Technology. And stick around to watch a demo of the product. Jed Ayres talks about the leadership position that IGEL has taken in the EUC market, the disruption they are causing in this space with their software-defined solution, and their partner community and ecosystem that is working together to push the end user computing market forward. With nearly 30 sponsors on site, there is a lot of great technology on display at the show. And IGEL is making a number of announcements during DISRUPT which Jed describes, and he also discusses a number of important partnerships and activities taking place. 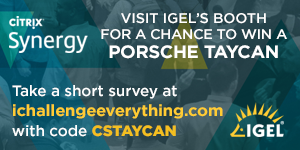 IGEL has also launched a new contest - the "I Challenge Everything" contest in which it will give away an all-electric Porsche Taycan or cash equivalent. Visit http://www.ichallengeeverything.com/ and use CODE: VMBLOG to enter. VMblog spoke with CloudJumper while at the IGEL Technology #DISRUPTEUC 2019 event taking place in Silicon Valley. CloudJumper is a software and services company in the Cloud Workspace and RDS enablement markets. CloudJumper Partners can select either CloudJumper’s full-service Cloud Workspace platform, or roll their own platform using CloudJumper’s award winning Cloud Workspace Management Suite (CWMS) software. CWMS automates delivery of hosted Windows desktops, application services, and Microsoft workloads. It allows IT service managers to deliver app streaming, VDI, DaaS and WaaS with minimal labor, lower costs, and faster delivery times.